My name is Stig Sjunnesson and I was born in 1938 and live with my wife Gunni on a forest estate in the middle of Halland, Sweden. During my working life I have done all sorts of things and when I retired a couple of years ago I left my 28th employer. 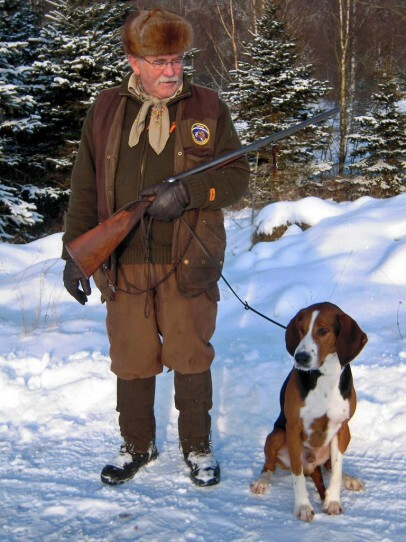 Born and raised in the rural countryside hunting and hunting dogs has always been the primary hobby activity for me. It has given me many experiences and friends and contacts. Craftmanship in different ways has always been there, sometimes more, sometimes less and the reason for knifemaking to become so dominant was, as so many other things, pure coincidence. On a booksale I found a book about how to make a hunting knife and this was the start of the hobby. Fall 2003 I made my first knife. My experience as a hunter made me understand how a knife should work but the craft to make it as I wanted was more difficult. The first years my knifes were nordic workmodels with leather sheaths. I have always liked hornknives with traditional engraving and on a knife fare I happened to be sitting next to one of the best hornengravers in the country who inspired me enough to try on this difficult craft. I believe I have improved over the years and have developed a personal style of work. For me function is the most important thing, then shape, color and decoration. My engraving is pretty traditional but I try to have my own style, others may judge if I have succeded. The material I use is from nature; reindeer and moose antler and nordic wood, mainly birch. Knifemaking has given us a lot of connections, so many lovely people all over the Nordic that we can call friends. We are very greatful for this and hope to be a part of this enterprise for many years to come!